Wizkid's Achievements Will Surprise You! 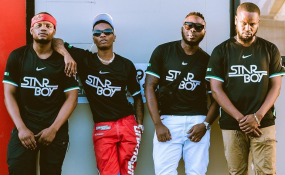 Wizkid collaborates with Nike For Starboy jersey. After a much-anticipated wait, the 'Star Boy' jersey, which was released on Monday at selected Nike stores sold out in 10 minutes. It only took minutes for the pop star to return to his instagram handle and write: "That was fast! Sold out in 10 minutes! Love you all like crazy! God is working harder than the devil!". According to Nike, the collaboration shirt is a celebration of Wizkid's Nigerian roots, and also a representation of the things that caught the fancy of Star Boy; football and fashion. The logo of Star Boy Entertainment, his record label, is printed on the front side of his jersey.